The Rule Interchange Format (RIF) is an activity within the World Wide Web Consortium aimed at developing a Web standard for exchanging rules. 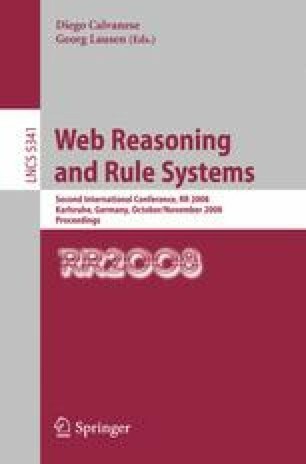 The need for rule-based information processing on the Semantic Web has been felt ever since RDF was introduced in the late 90’s. As ontology development picked up pace this decade and as the limitations of OWL became apparent, rules were firmly put back on the agenda. RIF is therefore a major opportunity for the introduction of rule based technologies into the main stream of knowledge representation and information processing on the Web. Despite its humble name, RIF is not just a format and is not primarily about syntax. It is an extensible framework for rule-based languages, called RIF dialects, which includes precise and formal specification of the syntax, semantics, and XML serialization. In this paper we will discuss the main principles behind RIF, introduce the RIF extensibility framework, and outline the Basic Logic Dialect—the only fully developed RIF dialect so far.